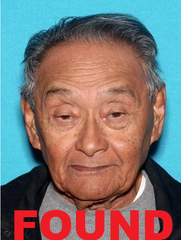 Cerritos deputies located at-risk missing person Florencio “Poncho” Villapania who was found safe, uninjured and in good health on Friday 23, 2018 at 4:58 P.M. Florencio was then returned to his home and is now reunited with his family. Los Angeles County Sheriff's Department and Mr. Villapania’s family would like to thank the public for their assistance in locating Mr. Villapania. 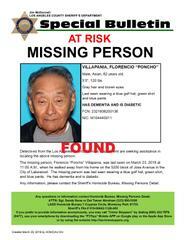 Detectives from the Los Angeles County Sheriff’s Department Missing Persons Unit are seeking the public’s assistance in locating Florencio “Poncho” Villapania, an 82-year-old Asian male who is a diabetic and suffers from dementia. He was last seen on March 23, 2018 at 11:00 A.M., when he walked away from his home on the 5200 block of Jose Avenue in the City of Lakewood. Florencio is described as 5’0” tall, weighs 120 pound, has gray hair and brown eyes. He was last seen wearing a blue golf hat, green shirt and blue pants. Florencio Villapania’s family is very concerned for his well-being and is asking for the public’s assistance in his safe return.